According to a Fox News poll conducted last week, 67 percent of likely voters do not think Hillary Clinton is "honest and trustworthy." That is five percentage points more than said the same thing about Donald Trump -- an amazing accomplishment, since the blowhard billionaire can barely open his mouth without lying. Clinton's credibility with voters may be even weaker than that poll suggests, since it was completed before FBI Director James Comey disclosed that agents had stumbled across another trove of emails that crossed the unsecured private server she improperly used as secretary of state. Whether or not the FBI finds any previously unidentified messages containing classified material, the discovery reminded everyone of Clinton's tendency to pile lie upon lie instead of coming clean about her mistakes. "I'm not making excuses," Clinton said at a rally in Ohio on Monday. "I've said it was a mistake and I regret it." Clinton did not manage to describe what Comey later called her "extremely careless" handling of "very sensitive, highly classified information" as a mistake until six months after The New York Times revealed her reliance on a personal email system during her tenure at the State Department. Until that interview, she did nothing but make excuses, and even afterward she continued to offer false assurances aimed at minimizing her misbehavior. 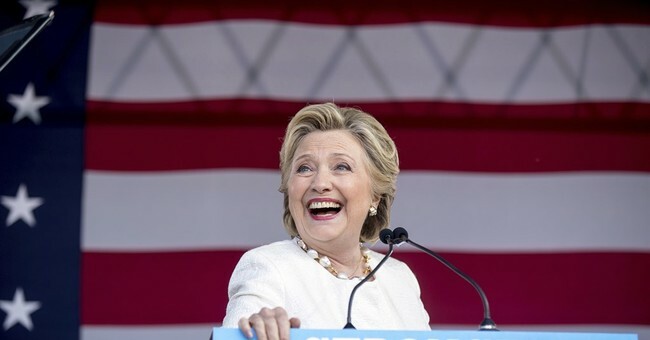 Clinton claimed that "what I did was allowed," that she "fully complied with every rule," that "there is no classified material" in the emails she sent and received, and that she "went above and beyond what I was requested to do." She also said she "opted for convenience to use my personal email account, which was allowed by the State Department, because I thought it would be easier to carry just one device for my work and for my personal emails instead of two." As investigations by the State Department's inspector general and the FBI later showed, none of that was true. Clinton did not comply with every rule, she did not turn over all her work-related email to the State Department or do so in a timely fashion, the email did include classified material, her use of a private account was contrary to State Department policy, and she carried multiple devices despite saying she sought to avoid them. Notwithstanding these manifest misrepresentations, Clinton falsely claimed Comey had verified the truthfulness of her public statements about the email controversy when he said he did not have any basis to charge her with lying to the FBI. Then she said that whopper was based on a misunderstanding, which clearly was not true. In other words, she lied about lying about her lies. "After a year-long investigation," Clinton said during her second debate with Trump last month, "there is no evidence that anyone hacked the server I was using." As Comey pointed out in July, the fact that the FBI did not find evidence of hacking does not mean it did not happen, since cyber spies are good at covering their tracks. Clinton also said "there is no evidence...that any classified material ended up in the wrong hands." Whether or not classified material in Clinton's email actually "ended up in the wrong hands," she recklessly took that risk, which is enough to charge her with violating federal law. Explaining his decision not to recommend criminal charges against Clinton, Comey said such a prosecution would be unjust without evidence that she had knowingly broken the law. But he conceded that the statute criminalizing the removal of classified information "from its proper place of custody" allows prosecutions based on "gross negligence." After the FBI examines the newly unearthed emails, Clinton said on Monday, "I am sure they will reach the same conclusion they did when they looked at my emails for the last year: There is no case there." That may not be true even in the narrow legal sense, and it certainly is not true of the case against Clinton's honesty.